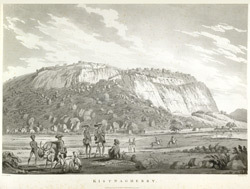 This uncoloured aquatint is taken from plate 20 of Captain Alexander Allan's 'Views in the Mysore Country'. Krishnagiri is a town in the Dharmapuri district of Tamil Nadu, bordering Karnataka. It is distinguished by the ruins of a building set magnificently atop towering granite boulders. The artist tells us that this was "a hill fort of great strength and local importance; and was for a short time in possession of the English in the war of 1768 with Hyder Ali, when it surrendered after a long blockade". British troops under Lt Col Maxwell attacked it in November 1791, during the third Anglo-Mysore war, resulting in 50 British casualties. With almost all their officers wounded or dead they were forced to retreat. The fort remained in Tipu's possession until the Treaty of Srirangapatna in 1792 ceded it to the British.